The PC Gamer market appears to have been growing in recent years, and it is an affluent audience, especially when you look at some graphics cards that can cost well over £1k nowadays. So it is no surprise that Acer has been expanding their Predator line considerably in recent years. Their gaming laptops have always been superb, and the Acer Nitro N50 desktop was a very affordable entry point for PC gaming. If you want a bit more power from your PC but don’t want the hassle of building one yourself then Predator Orion range could be the option for you. The ACER Predator Orion 5000 is the middle range of the series, with the extravagant 9000 sitting above it and affordable 3000 below it. Each model has many different configurations so you should be able to find something that fits your needs and budget. The models are designed to be upgradable, and the Orion 5000 uses a mid-sized case, with ATX form factor motherboard and a standard PSU. This does make it larger than the likes of the Corsair One or some Alienware models, but it gives you much more flexibility for future upgrades. It was priced at £1,399.00 on PC World, but there is no stock now, and your options are to either up or down a notch. 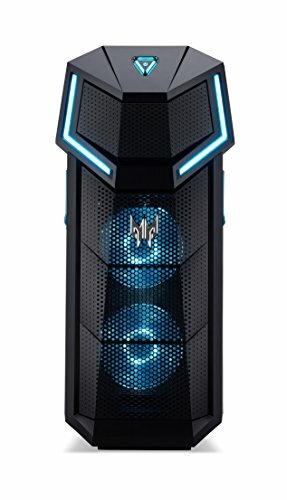 There is an Orion 5000 model with i7+ 8700, GTX 1070 8 GB, 16GB of RAM for £1800 which is considerably more powerful and probably worth the extra £500. Or there is the Orion 3000 with i5+ 8400, 8 GB RAM and GTX 1060 6 GB for £949.00 and will likely offer similar performance to the model I reviewed while being £450 cheaper. The Orion 3000 offers moderate value for money, with the individual components costing around £820 from Scan so a little over £100 for the build. The Orion 5000 with RTX 2070 offers slightly less value for money with a rough self-build price of £1400 so £300 extra. In comparison to other off the shelf companies such as the Alienware Aurora, both the above models appear to offer decent value for money. I can’t spec the Alienware properly at the time of writing nor match the components but the i5-8400 + GTX 1060 looks like it would set you back over £1k and the i5 9600K with RTX 2070 would be over £2k. As with most Acer predator products, this ticks most of the trends for PC gamers. The case is aggressively styled with sharp edges, the side panel is windowed displaying the components inside with all the fans using a blue LED. LEDs are also used around the case, and you even get a pop-out headphone mount. The case itself is OK, its bigger than many off the shelf products which makes it much easier to upgrade. It has an attractive design if you are into the gamer look but the overall case quality is on the lower end of what you would buy if doing a self-build. The side panels are thin slide off metal, they were screwed on with normal PC screws not thumb screws. Granted, most cases that I have reviewed with superior build quality tend to cost well over £100. The inside of the case is laid out reasonably well, in particular, the underside has a large opening for the CPU bracket, and there is a decent amount of clearance for cables as well as mounting 2.5-inch and 3.5-inch drives. The main compartment is a little more cramped than a full-sized case, but it is still easy to work with. The model I was sent had 2x4GB DDR4 RAM sticks, so there were two additional slots for upgrades. The stock Intel cooler has been upgraded to something much more chunky which should offer superior cooling than the stock retail option. The GTX 1060 is a normal sized but this used a blower style cooler which affects noise levels quite a bit. The PSU was covered in a basic plastic shroud and this hid a 720W FSP fully wired PSU, this helps give the build a cleaner look. The overall build quality was OK, it is better than what I do myself as I am terrible with cable management, but you won’t be showing off the build quality on Reddit or Instagram. When closed up, looking through the window does give the impression of a good build, you have a big chunky CPU cooler, lots of LEDs and most of the cables are hidden thanks to the PSU cover. I carried out the usual benchmarks for the sake of review purposes even though the performance of both the CPU and GPU are well documented now. The six core twelve thread Intel i7-8700 is more than adequate for both gaming and general productivity needs. If anything, it is probably too good to be paired with the GTX 1060 and the i5-8400 on the cheaper Orion 3000 model would be a better fit. The GTX 1060 is a competent card and can easily handle all the games you throw at it, though it is probably the lowest option you should aim for if you want a proper gaming PC. I still haven’t finished Far Cry 5 so this was the main game I played while I had the PC, and it ran everything flawlessly even when used on the 4K HDR Acer X27. It won’t run everything at ultra of course, but with the default settings, everything was butter smooth. Similarly, with Just Cause 3 which caused issues with the GTX 1050 on the Acer N50, everything ran smoothly with no problems. Ideally, it is best to run most games at 1440p or less and even then probably not at ultra-settings, but for games like Hitman, Far Cry 5, and GTA 5 I was consistently able to achieve 50fps+. My biggest gripe with this is the noise level. It is perhaps a little unfair to judge it as my main PC uses a Thermaltake Floe Riing RGB which costs £180 and both my GPU and PSU are semi-fanless. However, this is pretty noisy. Fans spin up immediately, and they are always audible regardless of where you place the PC. Under almost any load the noise levels increase considerably, it is not just the blower GPU that is the issue but the CPU fan. Looking at speccy under normal load showed the fan speed running at 1900RPM, in comparison my main PC runs its fans at 400RPM. For most people, it is probably not too much of an issue, but I sit on my PC 10+ hours a day, and I am not sure I could cope with fan noise all the time. The CPU cooler should be a relatively easy thing to upgrade with the cutout on the rear, or you could potentially swap out the fan itself for something quieter, it looks like the fan is clipped into place, but I am sure a few cable ties could help accommodate a superior fan. The ACER Predator Orion 5000 I reviewed isn’t available anymore, so it is hard to make a proper conclusion as there is no current price for it. The closest comparison isn’t even the same series as this but the Orion 3000, however, I assume it is about the same and based on the pricing and performance it is a decent PC. You can build something better yourself but if you are a parent wanting an affordable gaming PC for your child without the hassle of a self-build, then this is a good option. In particular, it appears to be cheaper than the Alienware equivalent and has better upgradability. NextSamsung Galaxy M30 specification revealed. How does it compare to the M20?